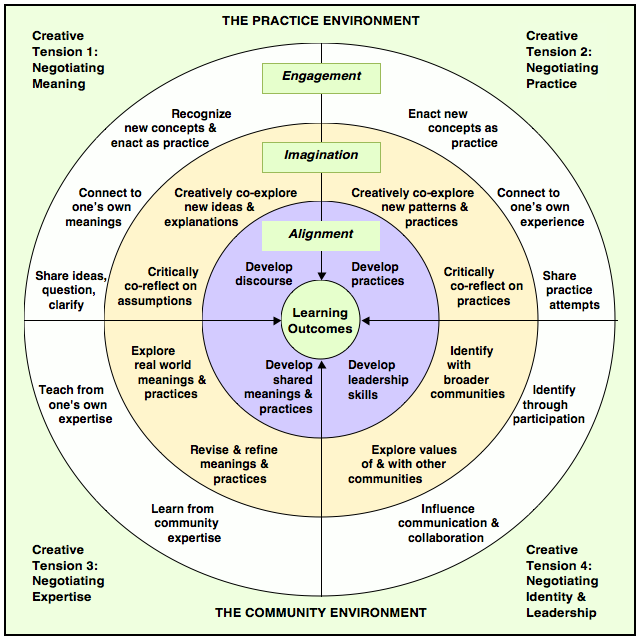 The communities of practice framework (Lave & Wenger, 1991; Wenger, 1998) puts into place important elements of context and process that support social constructivist learning in a practice environment. Etienne Wenger's brief CoP introduction defines communities of practice as "groups of people who share a concern or a passion for something they do and learn how to do it better as they interact regularly." The key building blocks of the CoP framework that I believe can effectively support professional education and blended librarianship are briefly discussed here. Communities of practice are distinguished by the presence of three dimensions - a domain that focuses identity and action; a community comprised of members, their relationships, and the trust, belonging, and reciprocity that characterize their interactions; and a practice - a repertoire of tools, methods, and skills that evolve through members' learning, use, and innovation (Snyder, Wenger, & de Sousa Briggs, 2004). CoP learning is based on mutuality and shared learning through the dynamics of dualities (Wenger, 1998). A duality is a pair of elements that is always present in different forms and degrees, not a spectrum that indicates movement from one pole to another. A duality can be characterized as a creative tension. The duality of participation and reification signifies the interaction between the social production of meaning and the concrete forms that reflect that meaning, such as an idea, an artifact, increased knowledge or competence. Wenger (1998) states that the interaction between participation and reification is essentially the negotiation of meaning. The duality of the designed and the emergent signifies the interaction between designed structures and those that arise organically through practice. Structures may be intentionally designed to direct practice, but these designed structures are subject to change. Thus, practice is not the result of design but a response to it. I characterize this duality as the negotiation of practice. The duality of the local and the global refers to how CoPs relate to other CoPs through crossing boundaries and bridging differences by means of boundary objects, brokering, and boundary encounters - opportunities for dialogue to develop collective understandings and solutions. I characterize the interaction between the local and the global spaces of knowledge and practice as the negotiation of expertise. The duality of identification and negotiability focuses on how individuals form identities through participation in community practices, multiple memberships in local and global communities, learning trajectories within a CoP, and modes of belonging. An individual takes ownership of collective meaning and shapes that meaning through negotiation and the power to influence action toward community goals. I characterize this duality as the negotiation of identity and leadership within the community. Negotiability is made possible through three modes of belonging: engagement, imagination, and alignment. Engagement is active involvement in meaning making, based on mutuality, competence, and continuity (Wenger, 1998). Through engagement, community members participate in and shape practice, contribute to the community’s shared history, and gain competence and respect. Imagination is seeing connections through time and space by extrapolating from experience through orientation, reflection, and exploration (Wenger, 1998). Imagination involves new insights, awareness of broader systems, standing in others’ shoes, creating models and visions, and reinterpreting histories. Alignment is coordinating activities and resources to fit within broader structures and achieve results, involving convergence, coordination, and jurisdiction (Wenger, 1998). Alignment involves finding common ground, defining visions, establishing procedures and structures, and exercising power to focus efforts. While these modes of belonging are not necessarily stages in an individual's deepening involvement with a community, a design to support learning in a CoP considers it logical to proceed from engagement to imagination and finally to alignment (Wenger, 1998). Lave, J., & Wenger, E. (1991). Situated learning. Cambridge, MA: Cambridge University Press. Snyder, W.M., Wenger, E., & de Sousa Briggs, X. (2004). Communities of practice in government: Leveraging knowledge for performance. The Public Manager, 32(4), 17-21. Wenger, E. (1998). Communities of practice. Cambridge, MA: Cambridge University Press.